Whats are peoples thoughts on him for the coming season? Last edited by Rich2086 on Tue Feb 28, 2012 11:02 am, edited 1 time in total. Posting for the sake of getting a few posts on the board. Either a complete mess or a consistent challenger. There seems to be no inbetween or semblance of moderation from him, a bit like Alex de Angelis in MotoGP - he could have been fantastic. I'm hoping he has a great season. I'm a huge fan, but it's often difficult to defend him when he acts like a pleb. It will be interesting to see if he has upped his game after getting beaten by Button last season. I think he'll do well this season! I think the thing that still may affect him is Jenson who will also do well this season. as long as that relationship is kept well and good, he should have a great season. The car is looking solid, and he sounds confident so good luck to him! I genuinely think he'll do well this season. Being honest I don't think Button was his problem last year. He equalled Button's wins, he made mistakes, and he also had his fair share of bad luck - punctures, pit stops, strategy errors. All in all he finished 43 points off Button. In your worst season ever, levelling wins with your team mate isn't too shabby. It's wasn't the cage rattling experience the media - BBC in particular - seem to think it was. He had a bad personal year. He shouldn't of let it effect his racing but he did. His heart is one of his strengths and one of his weaknesses. However, he was beaten for the first time, so I expect him to come back strong. If he can be consistent and show the race-craft he possesed in Abu Dhabi on a regular basis then he'll do well this year, and beat Button. Anyone who thinks he's lost it, or has no chance of beating Button, or can't be consistent is someone who fears him doing well. He is what got me into F1 so I HOPE he does well this year and show Button how to drive "fast AND smart". agree with you, good post. If Lewis continues the form he had at the end of 2011 it will be a killer year and i can't wait for him to shine!!! I think his erros last year made button look better. Not taking away anytihng from button but i think Hamilton is a better driver. Hopefully this season that will be evident when he takes the WDC! The Mechanic: You'd have yourself a real street-sweeper here if you put a little work into it. G.T.O. : I go fast enough. The Driver: You can never go fast enough. Hopefully he's sorted himself out. I am a fan and I don't think he deserves most of the stuff thrown at him. Anyone would think he's some disrespectful arrogant criminal given the reaction to some of his actions, but he's not. He's a passionate racing driver trying to do his best, but he somehow seems a bit emotionally immature (perhaps a result of living outside the "real world" for so long) and reacts in an unusual way to pressure. I wouldn't villify him though and I hope with a bit of stability and a realistic chance of winning, he'll take the opportunity again. * Massa Monaco 2011 (?) - Massa was the only driver to dive off his racing line when it was too late and Hamilton was up the inside. Legitimate overtake attempt. * Massa Monaco 2011 Part II - Massa lost it in the tunnel. Hamilton not at fault. For 2012, give them hell Lewis! This clip epitomises Hamilton's 2011...frustrating. Go Lewis! Show em' what your made of... 2012 is your season! 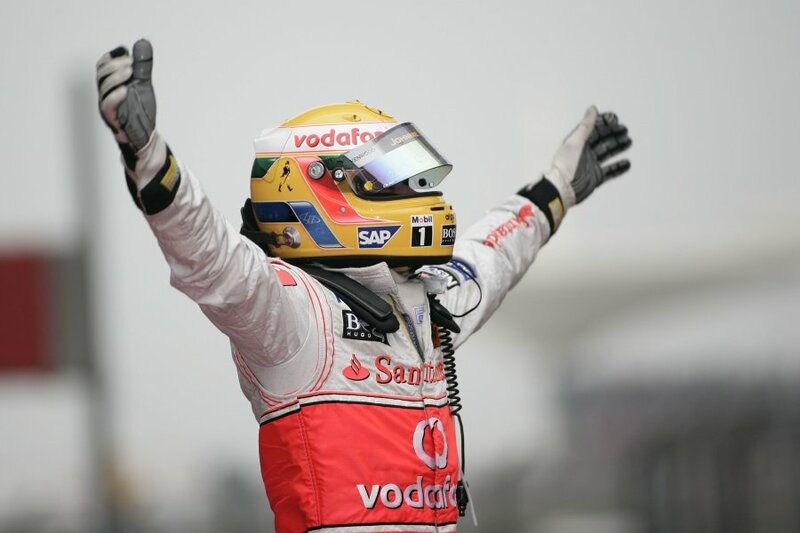 Do you have a high-res version of this photo f1madman? "Lewis is fiercely competitive, but he's also incredibly tough on himself. Over the winter he's gone away to reflect on 2011 - a season, incidentally, in which he was a multiple race winner - so I think it was anything but a disastrous year for him. And I also think that whether it's Kimi Raikkonen, Fernando Alonso, Michael Schumacher or Jenson Button, Lewis is not ready to come second to anyone in 2012. He also says they don't want to change Lewis, they want him exactly the way he is, even if there are some words in the heat of the moment , he later regrets ( like Monaco) It's a part of his fierce competitiveness. His unrestrained will for success and his passion is something they like the most . His never giving up attitude is incredible. They want to continue to work with him for many years, to come. Lewis had a poor season (by his standards) last year. erm he is a world champion who already beat Button once,i don't think for one second Hamilton thinks he is unable to beat Button or anyone on the grid as a matter of fact...his goal as should be for any driver in the top cars should only be about winning the championship. Raifosa, I'm sorry but I didn't come across a larger version of that picture in google, hun. Just watched a recording of last years Chinese GP highlights that i had stored on my HD.. Regardless of the problems they had prior to the start, we need Lewis to back into that kinda mind frame.. The way he raced that day and bought the car home winning the gran prix brought a tear to my eyes in the same way it did to him.. I just have one comment. Lewis out qualified Button last year most of the time. In addition I recall Lewis passing Button early on in at least 7-8 race. I never recall Button ever passing Lewis. There is no comparison of the two talents. He will not only destroy Button but, in equal machinery (hopefully) show Vettel his exhaust pipes. With a good car and a good start to the season, he has a great shot at WDC this year. The video showing the best overtakes of 2011... Most featured driver? Hamilton. I think, with the winter break, we could see a more relaxed Hamilton back and being a consistent contender (to nick the phrase). Can't wait to see how well he does this season! Fingers crossed he does well from Australia... it's going to be a fantastic year!! So, they are just rumours ... but what do you think? I imagine a lot will depend on how competitive mercedes are this season and how it goes "Vs. Button" too. I can think of worse teams to join though, if you aren't getting what you want out of your current team. Hmm interesting one iv never really thought about the possibility of him going to Mercedes. I guess if they can start to challenge at the front more then maybe but having said that i dont rate their 2 current drivers that highly I think MS is well passed it and Rosberg is overrated. And as for Lewis, who could be better to teach him how to handle the pressures that he seems to struggle with than Schumi? They assumedly set their cars up in a similar (kart like manner) and I think they could make a great team. Wow! It's been a while since I've posted in the forum. Life has gotten a lot more hectic for me. Besides, Vettel basically wrapped up the championship half way through the season last year. I am excited for this season though. I think last year was a definite low-point for Lewis but in my opinion, he is the guy with the most ability and talent in the field. I think this is the year that he finally puts it all together and shows that. With the amount of rotten luck he had last year, he's due for some good fortune. The first few races are crucial. If he gets off to a quick start, I think he's gonna take it this year! He's gone around the outside!! In an ideal world, a driver moves from one competitive car to the next ... but a lot has to be said of a driver who moves to a team that needs taking by the scruff of the neck and made competitive. Arguably, such a move can separate the good drivers from the great ones. I would be intrigued as to how Lewis would handle such a situation.